Effervescence: Three decades: Summed up !! Ah yes! Guess who's turning 30 tomorrow,the 16th? Yeah, pretty much me !! 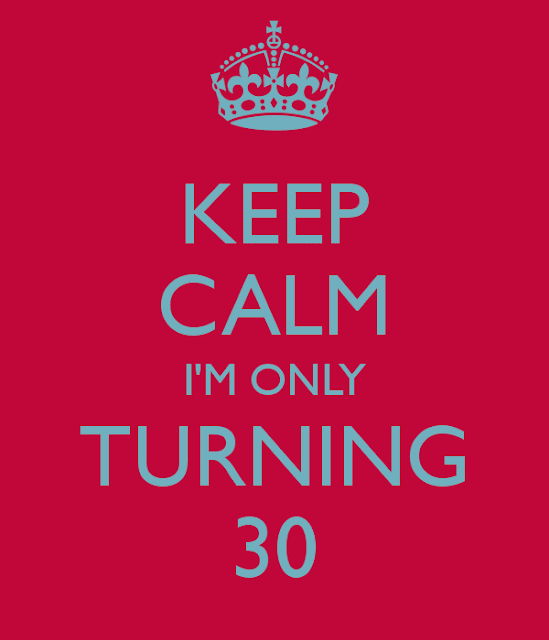 Do I feel 30 came too soon? Yes, totally. I'm realizing it pretty very much in the last few hours of my 20s and my life will forever be changed, now that I'm entering my 30s. But are the 30s something to be scared of? Something to freak out? Not to me. Last birthday I got a card from a close friend which said "Forever 29" ! 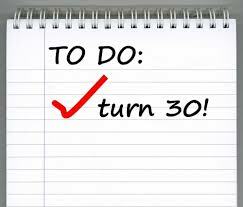 and it got me thinking: why do my friends feel I must feel anxious at the thought of turning 30? Why forever 29? I, for one would be 30 rather than 29 today. Not because I love getting old, but because I love understanding life, I love living life which I was not doing so well until the last year. I would never want to go back a year in my life, because from 29 to 30, I have become a changed person in many different ways. At 29, I expected a lot from life. I have become less irritable and short tempered in the past year. I have understood my food choices better (read: started eating salads for lunch). I have finally gotten out of the procrastination zone to keep my body fit because I have realized that's the only place I have to live in forever (and have been consistently walking and exercising). I have become more patient, have learnt to let things go and it's okay not to know all the answers all the time. 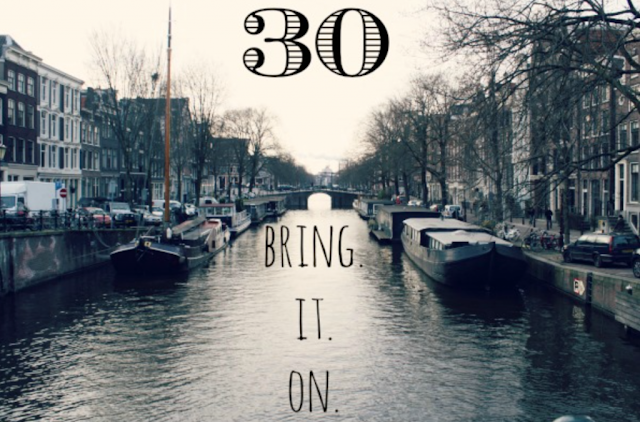 I would rather be 30 today than the fat, cranky 16 year old school girl who sulked at the thought of exercising and was super choosy for food; who used to hate everything about herself: from her name to her weight and her parents. I would rather be 30 today than the 18 year old, confused about her career choices and weather the direction is right or wrong; one who was shy and scared to wear a jeans in collage and to talk to strangers; who wanted to be hidden from the world and wore baggy clothes and covered her face and head with a scarf most of the times in public. I would rather be 30 today than the 20 year, still confused collage girl with zero friends and an introvert girl who was being made fun of every single day and who was mortified at the thought of being around or looking in the eye of boys in her class, let alone striking a conversation or even responding to one. I would rather be 30 today than the 25 year old young woman and a young professional, who was facing heartbreaks and sometimes crying herself to sleep; one who did not know who to trust and how much; one who was so uncertain about the future with so much instability in life with the young energy; one who opened herself up and regretted later every single time; one who chased after people who ignored her all the time, one who did not know how to identify true friends in the overwhelming crowd of so-called friends; one who was not getting proper sleep; one who was failing to establish trust and ended up trusting strangers more than her parents. I would rather be 30 today than the newly-married 27 year old who constantly had understanding issues with husband and thought everyday that her relationship was a failure; who did not understand her husband and always felt misunderstood by the husband; who did not have an idea about valuing her home, parents, food and everything else; who was having a hard time understanding the difference between dreams and reality. These three decades have made me what I am today. have few friends, but real ones. never cry myself to sleep. have a stable love (married) life. don't give a damn about what the society thinks or says. getting my eight hour sleep. getting better understanding between me and my husband. cooking and experimenting with new and innovative dishes. valued my home and parents. can integrate well in this new country. I would rather have all this and be a proud 30 year old than go back to the so-called "sweet 16", 20 years old myself, or 25 or 29, for the matter of fact !! So, bring on the 30s... !! I never had a bucket list to do before I turned 30 or something, but I did have a fair collection of quotes and words I intended to adopt in my life and here's the ones I have successfully been able to adopt and finally believing them firmly..
Be good, but don't waste time proving it. Do not compare your life to others, you have no idea what their journey is all about. It's alright not to know all the answers; stop thinking so hard. Worry is like a rocking chair; it keeps you occupied but takes you nowhere. You can be the ripest, juiciest peach in the world, and still there is going to be someone who doesn't like peaches. It's okay. The ship is always safe at the shore, but that's not what it was made for. Sail. Everything happens for a reason, that's always good. Might be difficult to believe in difficult times, but yes it is. Hard times make you stronger. And did I say growth is a continual process and of course age is just a number! There are a lot, lot and lot many more things I need to do, learn, grow and believe but trust me it's not that easy.. That's the reason I don't have a bucket list but here's a few I need to incorporate in my life as soon as possible and that's why I hope I must get them by my next birthday !! Say no without explaining yourself. Over-thinking ruins you, twists things around and makes everything worse than it is. No expectations = no disappointments. Enjoy your own life without comparisons with others. AND I'M READY TO PARTY ! !